ZigZagZine is a publication “by kids and for kids” and I am its editor. Our top story in this issue is about how we are changing the way it’s published. I dreamed up ZigZagZine a couple of years ago, and started publishing it soon after. It’s been so much fun helping ZigZagZine grow into what it is today. The zine has been a place where kids and teens can be published online, and get just as much recognition for it as someone much older. After all, if someone has quality work, the world should know! It’s also been a learning experience for me–I know a lot more about writing, editing, page layout, and Web publishing than when I began! ZigZagZine has always been published on the Web–but as a pdf document, linked from a blog-based Web site. This issue was created that way, in newsletter format using a page-layout program, and then saved as a pdf file. However, this is the last issue we’ll publish in this format. From now on, we’ll publish stories, articles, poetry, photography and artwork on individual Web pages, at zigzagzine.com. Starting with the November/December 2007 issue, ZigZagZine has been published every two months for almost two years. Over that time, I’ve edited and published eleven issues, with contributions from kids across America. Together, we’ve covered a wide range of topics, from wizards to hermit crabs, from former presidents to Chihuahuas. We’ve had articles on monarch butterflies, goldfish, Genghis Khan, Charles Darwin, and many others. And on top of that, lots of stories, poems, art, and photography. You can still read all of our past issues and all the content in them on our Web site! We’ve updated the site to reflect the new Web-based approach. If you take a look at zigzagzine.com, we now have links at the top of each page to Articles, Stories, Columns, Art, Poetry, Miscellany, Book Reviews and Photography. All future content will be published directly on Web pages under these categories. For example, here is a link to this very article on the Web. Whenever a new submission is added to the site, I’ll write a blog post to let everyone know about it. But since no one will check the blog every single day, I’ll use the ZigZagZine Announcements mailing list to notify readers. If you’re already subscribed, great! If not, you can subscribe here. One benefit of switching to Web page publishing is that we can publish material continuously, instead of issue by issue. You can submit your material whenever it’s most convenient, and we can publish it soon after we receive it. Before I started ZigZagZine, I experimented with editing a different newsletter. It was called “Kids Times,” and I only created three or four issues from late 2005 through early 2006. It was pretty cool at the time, but it had some serious limitations: I created it on the computer (designing the pages in PageMaker), then printed out multiple copies on paper and mailed them to a small group of friends. Two problems right there—(1) it cost money to buy ink and paper, and I was publishing it for free, and (2) it couldn’t grow any bigger, but just remained within the little circle. The next year, I wanted to start up Kids Times again. But this time, I wanted to reach a wider audience–kids and teens across the country. My mom and I brainstormed a name and slogan–ZigZagZine: Creating, Thinking, Imagining (my friend Kaizen helped with the slogan). Then, my mom helped me build a Web site. We decided to use Blogger.com, and I got my own domain name, zigzagzine.com, so that we could link to non-blog Web pages later on (that turned out to be a good choice). After considering the possibilities, we decided to publish the zine as a pdf. The original idea was that readers could print out the pdf, and have a print zine to read. I solicited a few submissions from friends, and, with mom’s help, learned how to lay out the issue using Adobe InDesign. I wrote my first article, created the pages, and figured out how to export the zine to a pdf. 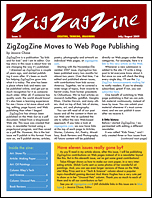 Then, on November 14, 2007, the first issue was posted, and ZigZagZine was launched! From there, it has grown. Early in February of 2008, David Blatner and Anne-Marie Concepcion interviewed me about it on their podcast, InDesign Secrets. The podcast is about the Adobe page design program, InDesign, and since I made the zine in InDesign (and was then, at 10 years old, the youngest person they knew who used the program) they were interested. You can see that blog post here. The day the podcast went up, several people who had heard the podcast commented on the InDesign Secrets site about ZigZagZine! In the next issue, March/April 2008, I wrote an article about elephant seals, and took the photos myself when touring Año Nuevo State Park, a great place to see the huge seals during breeding season. Shortly after the issue was published, I suddenly got over 250 page views in one day! When I told my parents, my dad (whose job involves new media publishing) said that he had told one of his blogger clients about the zine. It turned out that she had written a post on her blog commending my seal photography! Now, almost two years later, it seems like a good time to convert from pdf publishing to Web page publishing. As I said above, we had intended for readers to download and print the pdf, but it seems that few people actually do that. So instead of making readers download and print an issue every month, we’re making the zine more accessible, so that checking out the latest submissions is as easy as viewing a Web site! This is a new beginning for ZigZagZine! I can’t wait to publish more of everyone’s work, and keep doing what I love.